Capable. Powerful. Portable. The ClamCase Pro for iPad Mini pushes your device’s productivity into overdrive while maintaining its sleek and lightweight design. Add unmatched levels of efficiency without compromising your typing experiencing. Compatible with iPad Mini 1 / iPad Mini 2 / iPad Mini 3. Charging via power adapter or USB connection. Micro USB to USB cable included. Quickly and easily power on/off keyboard with manual power switch. LED indication lights provide information on battery life, pairing, power activation, charge and Caps Lock. The lithium-ion battery and Bluetooth 3.0 chip allows for months of use on one single charge. 129 of 129 people found the following review helpful. Like so many others, I have never written a review on Amazon for ANYTHING. But due to the price point and the many, many glowing reviews (as well as articles) circulating the www., I feel obligated to share my experience with the product. I bought my case in April of 2014. After many, many hours of research and one returned product, it became obvious to me this was the way to go. Yes, it's pricey. But I'm in the camp of folks who believe it's better to put down the chunk of change up front on the *right* product - one that does exactly what you want it to do and will last - than waste money cycling through multiple versions of the wrong product. So, I plunked down that change and eagerly awaited my ClamCase Pro. For starters, when I received the product, the "M" key got stuck every time I touched it. I could have returned it for a replacement, but after waiting 1 1/2 months to receive the product in the first place, I didn't want to have to wait another long stint of time. Besides, the beginning of my travel season was right around the corner, so I figured out how to finesse the key so it wouldn't stick. No dig deal, just a little annoying. After all, the price leads you to expect higher quality out of the box. Then, suddenly, things began to fall apart. I coddle this thing. For real. I value money, so I treat my stuff with respect. For travel I protected my ClamCase and iPad by housing it in a thick, padded sleeve, and kept it on my person at all times. About 2 months after purchase, the first rubber gripping foot on the bottom disappeared. A month after that, I lost another. Then, around October, I found a small hairline crack on the corner of my case. Again, annoying, especially because I was taking such great care of it. But I was so stubbornly convinced it was the best case ever, that with a sigh I let it go. Don't sweat the small stuff, right? The final straw happened this last month. The keyboard just up and stopped working. Naturally, I assumed it simply needed charging. I plugged it in, it seemed to charge just fine, when the charging was complete I gave it a test, sure enough I could type again. A couple days later, it needed recharging. I become annoyed at this point and began using the on-screen keyboard while leaving my iPad in the case for protection. Last night, I plugged it in to charge the battery, tested it, all was well. This morning I got to work and turned it on for a little typing, sure enough, no luck. It's dead, yet again... The keyboard is no longer holding a charge. When you spend $129 on a case for your $500 (or whatever) iPad, you expect it to last. Period. I went online to check the warranty, after all, it's a $129 product that I bought less than a year ago. Figured there would be a 1-Year warranty (which I admit I should have already known) and found out the warranty is only good for 120 days. 120 days?! What?! So now I'm the not-so-proud owner of a very expensive, and not so effective, damage protection case rather than BT keyboard case. I'm not fuming. There's no point. Won't change anything. What I am is disappointed. Disappointed in ClamCase, disappointed in the glowing consumer reviews (give it time, folks, just give it time) and disappointed in the many reputable magazine and news outlets who endorse the product. Please, don't become so attached to the idea of the case that you overlook those of us who have had the product for a while and who are warning you to stay away. For comparison purposes, I also own the ZAGGKeys Silver Cover Keyboard and the Logitech Ultrathin Keyboard. Each has pluses and minuses. 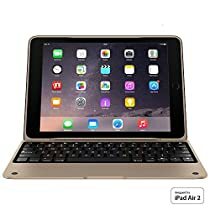 This ClamCase is a more expensive option, and it's nice inasmuch as it provides actual cover for the back of the iPad mini, and a good hinge that allows you to tilt back the iPad to a more comfortable working angle when perching it on a table or desk. However, there is a design flaw; the weight of this ClamCase - and it is MUCH heavier than the other two - is not placed in the front where your wrists would go, and so it tips over backwards a lot when you tilt the iPad back enough to use it at the right reading angle. Furthermore, its keys are not backlit. For me, it therefore doesn't offer enough of an advantage over the Logitech, which is thinner, lighter, and more aesthetically attractive. There is a crowdfunded project out there for a "kickstand4u" attachment that will go on the back of the mini and allow it to be propped at whatever angle you want, and not tip over; once mine arrives, I'll go back to using the Logitech, and donate this ClamCase. Case cracked on both sides of hinge in less than 6 months so case useless, by which time Amazon would not accept a return. Also keypad has tendency to type same letter more than once. Expensive and now useless!